Schools generally receive expense allowances and participation money for going to a bowl, depending on each conference's bowl distribution formula. At a later date, every team in a conference usually gets pooled money from the rest of the league's bowl revenue. But at least they got those pesky ticket allotment requirements lowered. That’s good news, right? Well, maybe not so much. Hey, UConn, we are looking at you when FSU fans have ordered double the amount of their allotted tickets for the BCS Championship game. On the other hand, the Gator Bowl's ticket sales aren't exactly hot, at least based on the aftermarket prices. You can get into the lower level for under $50 on the Nebraska side (nearly exactly where I sat for Georgia-Florida this year). 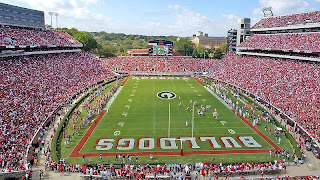 Lower level on Georgia's side starts at about $60. The 'not so much' Blutarky speaks of is that more of those bowls will be selling tickets to local interests, including those that work in the street level after market sales game. While that hurts some bowls like the Music City or Advocare v100, it doesn't matter a bit to the Peach or Cotton, because those places always pull big crowds. I guess as long as those sellout streaks remain alive and the conferences make bank, match-ups don't really matter anyway.